Update: We know that DNA washes out. So, many could have connections to the Middle East, or North Africa, or the Mediterranean, show no Jewish DNA, and still be Jacob's descendants according to Romans 11. This is an important fact of DNA. Sometimes you may not inherit DNA from distant grandparents. Perhaps research in the future will somehow change this science to help us see better into the past. Therefore, if any are called to be Christians, know that my example of having Jewish DNA, Ashkenazi and Sephardic, is an example of the truth of Romans 11 given for your faith, and Luke's passage concerning the fullness of the Gentiles being completed has been proven. I relate, through Admixture and also with triangulation with known Ashkenazi and Sephardic cousins, in trace amounts, bearing witness to the natural grafting of branches as revealed in Romans chapter 11, but does not define the DNA of all Christians. The fullness of the Gentiles has been fulfilled. Physical Israel is a sign of this according to Jesus Christ, but physical Israel is not the new Zion. 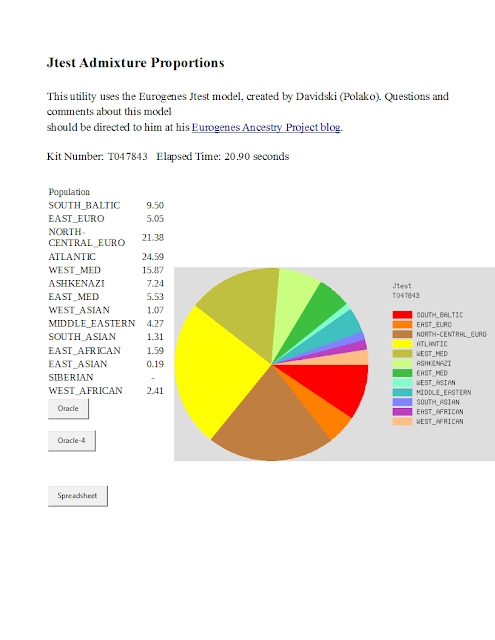 Keep in mind that the Gedrosia K3 test at Gedmatch does show ancient Jewish DNA. I have results down this page for you from that test. For those of you who cannot find much current Jewish DNA, sometimes you can find ancient Jewish DNA for a Diaspora that could have been from Babylonian and Assyrian times. Most Ashkenazi Jews have this ancient DNA, but they likely returned to Israel, while my ancients did not return to Israel! While disputing endless genealogies has nothing to do with the gospel and the power of God, the Scripture says that the blood descendants of the Hebrews would be grafted back into the olive tree. Note that Gedmatch is where the test results show below were taken. Gedmatch does not accept Y tests but accepts autosomal tests from Family Tree DNA, 23andme, and Ancestry, as well as a few lesser brands. Y tests are good for the projects on FTDNA, however. I tested with all three. Ancestry found my nephews. 23andme found the exact chromsomes where my Ashkenazi Jewish DNA resides. That helped me in going to Gedmatch and finding triangulated cousins on those chromosomes and the overlapping segments that prove we are all related to each other. Gedmatch has a tier one program you could pay for one time if you want. You can run each chromosome and I ran the triangulation for chromosome 6 and chromosome 22, where my Ashkenazi Jewish relatives were found! Paul viewed descendants of Israel as a race, a line of people by blood. He spoke in terms of physical descendants of Jacob. In Romans 11 the Apostle did not put a religious test upon the descendants. That was revealed to him before any DNA testing existed by a couple of thousand years! The prophesy of Paul is being fulfilled at this very time in history! The elect are Christians, not followers of Judaism or they turn from Judaism to Christ, hence the emphasis by Paul of blood lineage. The natural branches are being grafted onto the olive tree! If you know you are chosen, and Christ is revealed in you, no test is required. There is desire of some Christians for the salvation of some Gentiles, as Paul held out hope for the Jews who had been hardened, that some of them would be saved. But that is Paul speaking as a man, wishing the best for his people. God hardened the Jews in his lifetime, for almost 2000 years! But if you think you are Jacob by blood, it is not necessary to test, as I have done it here. If you cannot afford it you have nothing to worry about. The time has come, and the prophesy is being fulfilled! In Romans 11, the Apostle Paul is not talking about this or that individual being cut off, as the elect will continue in belief to the end of life. He is talking about Jews being hardened as a race, and then Gentiles as a whole being hardened, while Jews start to be called at the very end of time. And here we are in the last days, just happening to have DNA as a way of verifying genetic roots. It is almost as if Paul anticipated this ability, or at least God certainly did when he told Paul to write the inspired revelation in the book of Romans. That means if you find yourself called to be a Christian by the grace and power of God apart from free will, you may be interested in finding out your DNA roots, not by endless dispute, but by science. It is not a test of faith. It is simply for your knowledge. The Y test with STR's is valuable for the projects, but Family Finder and/or Ancestry and/or 23 And Me Tests with SNPs are better to start, and can be uploaded for free to Gedmatch. Upload those tests to Gedmatch, and they give easy directions, and you can run the tests like you see below. Males in the family can take the Y. Do not let these results shake your faith. True Christians will not have their faith shaken and endure in faith to the end of life. DNA washes out. should be directed to him at harappa@zackvision.com or to his HarappaWorld blog. We appreciate him making this excellent tool available here. Jtest is just a guide. The author has said it is not that useful. But scroll down for more of my results. I cannot show you the Jews I triangulate with because they are confidential. But they number close to 200. Someone who is fully Ashkenazi is going to show only about 29%, Jewish on the J test. The rest of my Jewishness is going to be included in Eastern Mediterranean, or Middle Eastern, or possibly other areas. I tested Yemenite Jewish, North African Jewish, Romanian Jewish, Mozabite, Moroccan Jewish, and Ethiopian Jewish. When Paul said that the descendants of Jacob would be called he made no attempt to indicate a threashhold for how much DNA was necessary to be a descendant. I assume it is any amount DNA! I also tested strongly Sephardic/Moroccan Jewish. Regarding Israel and Zionism, it a colonial project funded by the Rothschilds that was established only 200 years ago. It is a project that is not authorized by God, as the real New Zion is established by divine action, ie, the perfect sacrifice. Israel should live peacefully with the Palestinians, many of whom have Ashkenzi and North African Jewish DNA from ancient times. They deserve respect that they are not getting. Their land was stolen from them by the colonists. The end that many Zionists have for the Levitical descendants including the Cohens is to service a new Israeli temple. This does NOT have the authority of God, and is a great deception if it is ever permitted to come to pass. The Old Covenant and inferior sacrifices are done, for good. Christ, who offered Himself as the perfect sacrifice for the elect in Christ, is not after the order of the Levites. So, those who know they are of the tribe of Levi have no authority to establish the priesthood, although it is amazing to contemplate that you were tied by the Y test to the patriarchs. This is awe inspiring. But DNA does not make a Christian superior to another Christian. The power of the gospel as the only way of salvation for Jews and Gentiles is equal for all. There is one new man in Christ, as the Apostle Paul says, made up of Jew and Gentile. In closing, please keep in mind that the nation of Israel is not a true Zion. Paul would never have considered a true Zion without Christ. And since Jesus Christ said that His Kingdom is not of this world in the New Covenant age, Israel or Mormon Utah or any other Zion that is physical in nature is not a true Zion. Paul was concerned that out the blood lines of Jews at the very end of time would arise believers in Christ since the hardening is over. But this is not Paul condoning fake physical Zions. Christians live in peace with all men and women, and even do not seek to harm those Zions which are not the true, spiritual Zion. God will judge them, not mankind. Your third cousin is the great-grandchild of your great-great-aunt or great-great-uncle. You share a set of great-great-grandparents with your third cousin, but do not have the same great-grandparents. Fourth cousins have one set of great-great-great-grandparents, but not the same great-great-grandparents.